The thrill of the racetrack, the function of a book shelf! In keeping with the entire line of PitStop furniture, the PitStop Furniture Chicane Bookcase provides the ultimate in race-inspired form and utilitarian function. 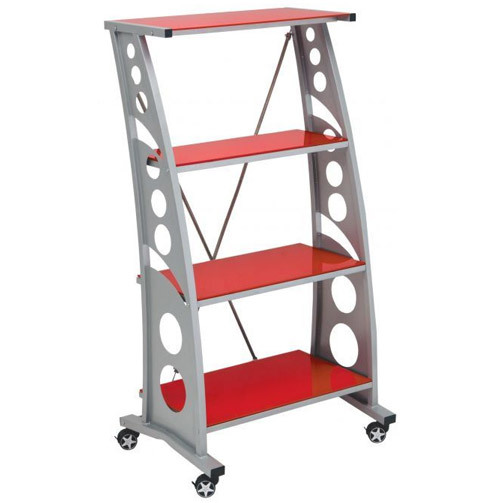 The beautiful design of the PitStop Furniture Chicane Bookcase is a welcome addition to any home or office. The sturdy PitStop Furniture Chicane Bookcase unites your love of the racetrack with your need for functional storage space. Your books, office supplies and memorabilia will be stored in style when you add the PitStop Furniture Chicane Bookcase to your office ensemble. The PitStop Furniture Chicane Bookcase frame is made from sturdy steel alloy, with stainless steel braided hoses crisscrossing the back for additional lateral support. Four durable tempered glass shelves keep your stuff organized and at hand. For locking 22� style racing wheels provide mobility when you need it, and stability when you don�t. PitStop Furniture Chicane Bookcases are designed and assembled in the USA from the highest quality materials available. PitStop Products are backed by an Intro-Tech Automotive, Inc. lifetime warranty. The quality in craftsmanship is evident in each piece of PitStop furniture.